Camel Charisma also known as Lokhit Pashu-Palak Sansthan is situated in Rajpura, 40 kilometers away from Bali. It is run by an NGO. It is a project for Pastoral People of Rajasthan. Lokhit Pashu-Palak Sansthan means "Pastoralist Welfare Institute". It is a small organization devoted to applied research and development for the benefit of people depending on animal husbandry for a living. LPPS has grown out of involvement with the camel pastoralists in the Godwar area and maintains close ties with the Raika/Rebari community. The number of camels in Rajasthan has halved over the last decade. This has serious consequences for the many poor people who inhabit the Thar Desert and neighboring areas of the State. It also affects the State's economy and ecology. So this NGO under the leadership of Hanwant Singh Rathore started this LPPS in 1996 in Rajpura. From 2007 this sansthan is active in villages of Jaisalmer also. They conserve camels and camel products are made. Camel milk is used to make ice-creams, its dung is used to make paper, its hair is used to make woolen clothes and its fat is used to make soap. Founded by a group which included veterinarians, anthropologists and others, LPPS was registered under Rajasthan's Society Registration Act in 1996. Its goal is to support and learn from pastoral communities as proponents of ecologically sound and socially just animal husbandry. This sansthan has not only conserved camels but also has given employment to the youth. Mr. Parth Guin and Mr. Rakesh Kumar, Art & Craft Teacher voluntarily painted the Pre-Primary Section and have given a new look to Nursery Class. Students will have a lot of fun in their class. Thank you both for your hard work. Mrs. Kavita Devda donated flowers to the school. Thank You Ma’am. We should give respect to our parents, teachers, our elders and ourselves. We respect ourselves by giving respect to elders and youngsters. We should give respect equally to all people who live in country either he or she are elder or younger than us or may be of our age. We should give respect to people by talking politely to them, become helpful to them, heartfelt to them and don't talk rudely to someone who speak to us very nicely. We should give respect to our parents by obeying what they suggest, their orders, their works, don't speak against them when they are explaining some things about our future it is very helpful to us to become a higher post person in our life. We should respect our teachers by maintaining self discipline so they don’t have to shout on us, we should be a good listener to them, we should also obey our teachers what they are teaching or explaining to us. We should behave like good students. We should not treat anyone unequally. We should give equal respect to our elders or youngsters. Thursday, 28th July: Mrs. Tamara Kribs visited the School .she interacted with students of Class X .and enjoyed to tell them about her living place and about her culture. Ed: Tell us about yourself and your business? TK: I am from EXSUL Travel-Hand Rafted Tours and Volunteerism plus Internships and Exchange and my business partner is from Himachal and many of my team members are Indians. Ed: For which organization do you work and which place do you belong to? TK: I used to work with an organization AID artisans and I belong to Cinadicad in US. Ed: Since how long have you been coming to India and what do you like most in India? TK: I am coming to India from the last one and half year and I like the Indian culture. Ed: What do you like the most about Fabindia? Ed: What would you like to do in India? Ed: Tell us about your family. TK: I have two children, daughter 17 studying in a university and son who is 15 and is studying in high school. Ed: Would you like to visit Fabindia again? TK: Well this was my short meet but next time I will be very happy to spend more time with the Fabindians. Saturday, 6th August: Intra Class Drawing Competition was organized for students of Middle Section. Theme for Drawing Competition was given. 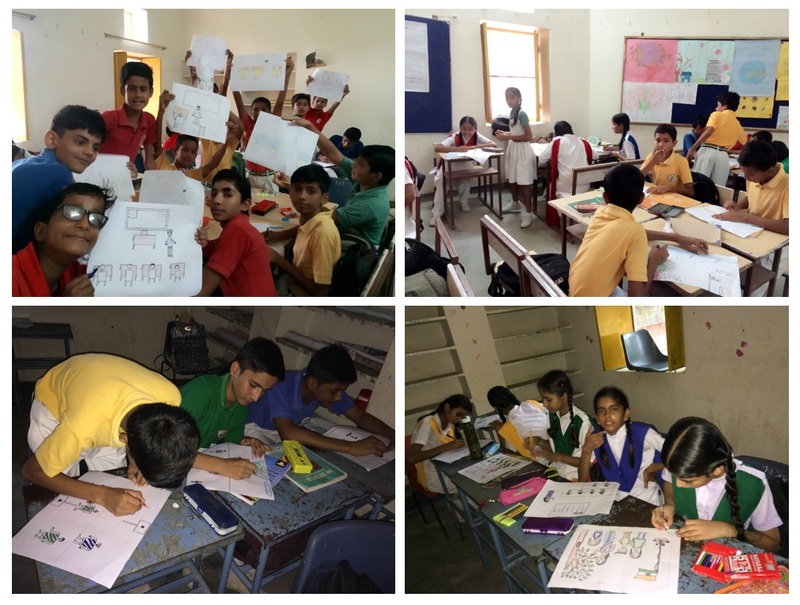 All students participated and made beautiful drawings of their respective theme. Results awaited. Monday, 1st August: March past and PT display practices commenced for Independence Day celebrations. A set of students are practicing as a contingent to represent the school at Bali level at Government Higher Secondary School. A group of girls are practicing for dance to represent the school at Bali level at Government Higher Secondary School. 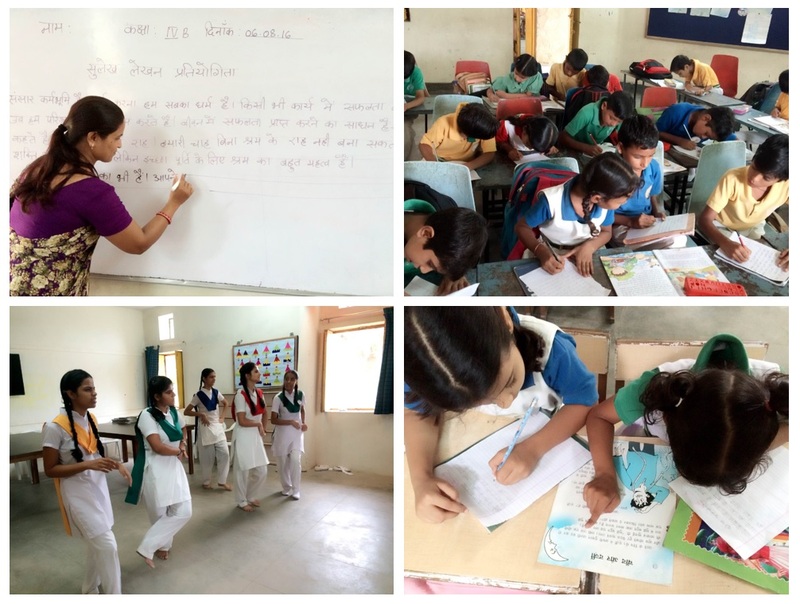 Saturday, 6th August: Intra Class Hindi Sulekh Lekhan was organized for the students of Primary Classes. Hindi Teachers gave the students to write a paragraph. Students wrote in beautiful handwriting. Thursday, 4th July: Teachers had their PDP Session with Chairman Mr. Sandeep Dutt. He told them about Good School Project and Record Book which is going to be introduced in school for the students. After that he asked the staff to give five positive learning and five challenges of PDP Session. The five positive learning were: Better Interaction, technology is helping to communicate better, critical thinking, overcome negativity and learn to work as a team. The challenges that the staff are facing are: Lack of coordination, sessions are too long, people missing in groups so there is no proper attendance, to add audio-visual medium and put extra effort in it. Staff has promised to overcome their challenges and draft story of the first chapter at the end of this month. School welcomes Mr. Bharat Khandelwal as our new Biology teacher and Mrs Ishu Chouhan (Ex Fabindian-2014) as our new English teacher. School wishes them a rewarding time with us! Thursday, 4th July: Khushboo Punmiya have been to school for the first time after completing her 12th in 2014-15. At first we congratulate her as she has cleared her IPCC examination. KP: I have cleared my IPCC and going to pursue for article ship. Ed: What are your future plans? KP: I have to become C.A and C.S and want to become C.E.O of a well established company. Ed: How did you feel when you came first in district level? KP: I was greatly excited and cheerful and was speechless at that time, but I was prepared for it. All thanks to my teachers and family, friends. I am thankful to our Principal and special thanks to my teachers. Ed: Who is your limelight or idol? KP: My limelights are my father and sister. Ed: Your friends who studied with you are they all in your contact now also? Ed: What changes you have observed after leaving this school? KP: It is well developed after I left it. Ed: How was your experience on your visit to school? KP: It was a nice experience. All teachers and students welcomed me with a nice attitude. Ed: Anything else you would like to tell us? KP: I am glad to inform you that I am pursuing CA and CS and I have cleared seemed phase of their run-CA Intermediate [IPLC] Examination. I have cleared both the groups at 1st attempt and scored 406 out of 700. I think school is the 1st place to build up your base and that, is why the reason I am here to thank our school and celebrate the triumph. My success began from school when I scored 95% with district top in 12th board which could be possible only with the enhancing knowledge and mental and practical support from our school. It always leads the motive of girls’ empowerment and I think it always fulfilled. Thank You.